It was a return trip to Bryn Masonic Hall for Provincial Senior Grand Warden John Karran, to officiate as principal guest and representative of the Provincial Grand Master Tony Harrison at the installation of Gary Jones into the chair of King Solomon of Vigilance and Douglas Lodge No 6236. John Karran congratulates Gary Jones on attaining the chair of Vigilance and Douglas Lodge. John was delighted to attend on this special occasion for Gary and the lodge. He was accompanied on his visit by grand officers Geoffrey Porter (Wigan Group Chairman) and Eric Picton, along with Provincial Junior Grand Warden Barry Dickinson and supported by acting Provincial grand officers Eric Bailey (PrSGD) and Geoff Whittle (PrGStwd), together with group vice chairman John Selley. WM Alan Abbott conducted the initial business of the lodge and welcomed the principal and distinguished guests. He then, invited Roy Hart to take the chair and install the successor on his behalf. The new WM, Gary Jones, was presented by his father-in-law Malcolm Cook. 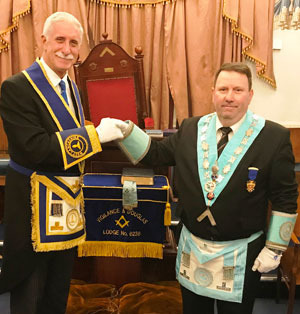 John was treated to a wonderful ceremony, with a confident and dignified performance from Roy, assisted by members of the lodge. Roy Hart continued his good work by delivering the address to the new WM, whilst lodge stalwart Bob Heyes gave the address to the wardens. John Karran, in turn, delivered a faultless address to the brethren of the lodge. Cyril Brindle gave a heartfelt address to the new WM and presented him with the Hall Stone Jewel, an honour bestowed on Douglas Lodge prior to amalgamation. Pictured from left to right, are: John Karran, Gary Jones, Roy Hart and Geoffrey Porter. 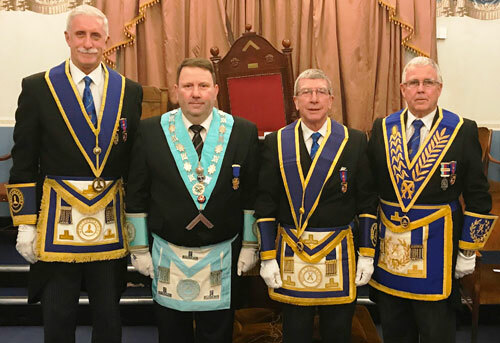 Following the ceremony John brought the greetings of the Provincial Grand Master, who, he said would have been delighted to witness such a fine installation, and on his behalf both thanked and congratulated Gary on attaining the chair of this fine and historic lodge. John made special comment on the quality of the ceremony he had just witnessed and congratulations were also given to all the brethren who had taken part. John was grateful to receive charitable donations from Roy on behalf of the lodge consisting of two cheques in favour of the Grand Charity as a donation to the MCF 2021 Festival for £500 and West Lancashire Freemasons’ Charity for £250. All were then treated to a fine festive board. Gary is an HGV driver in his professional life, has been married to wife Christine for over 30 years and they have three children. Apart from Masonry, Gary’s main hobby is motorcycles, having been passionate about them since childhood and currently owns four different models. Pictured from left to right, are: Eric Bailey, John Selley, Eric Picton, John Karran, Gary Jones, Geoffrey Porter, Barry Dickinson and Geoff Whittle.